Ever wondered what happens when you ask to try on a shoe in a Foot Locker store and the staff disappear off to get the right size for you? 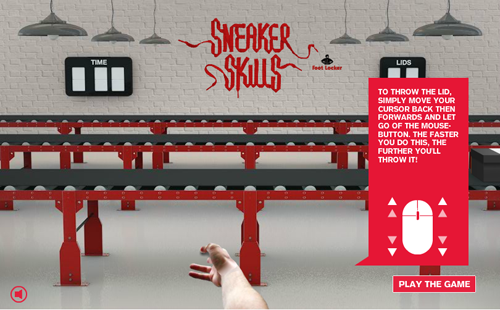 Well, the latest viral campaign from Foot Locker, 'Sneaker Skills' uses this situation as the starting point of a narrative which presents a fun, cheeky and engaging representation of the brand through the eyes (camera phone) of one of its staff members. The film devised by Abbott Mead Vickers BBDO appears to show the skills of a gang of Foot Locker staff as they use acrobatic trickery and some fancy footwork to get the job done. Filmed in one single shot, the ad took more than 300 takes to perfect and you can almost sense the joy at completing the take as the nonchalantly flipped cap nestles onto the mannequins head. This style of 'behind the scences' mobile filmed content is perfect for a piece of viral content. Are they real staff members, was it really shot live are some questions that are sure to arise from this style and any debate about its authenticity creates extra publicity and viral reach for the brand. 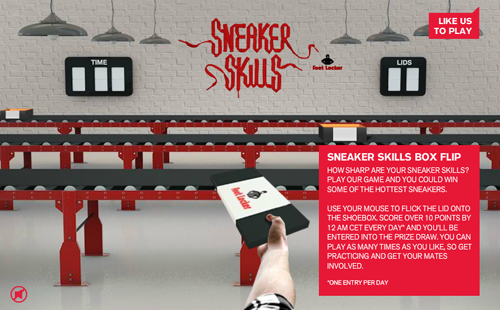 In combination with the film, Foot Locker have created a Facebook game where fans of the brand can hone their 'Sneaker Skills' and enter into daily prize draws to win the hottest sneakers around. 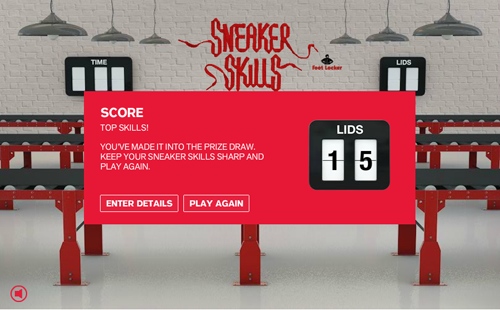 The game see players needing to flick lids onto moving shoe boxes. 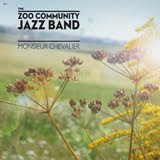 Score over 10 before 12am every day and you will be in with a chance to win. The campaign seems to be well constructed and has all the elements, intrigue, aspiration, and competition which should engage the youth market it seaks to attract.